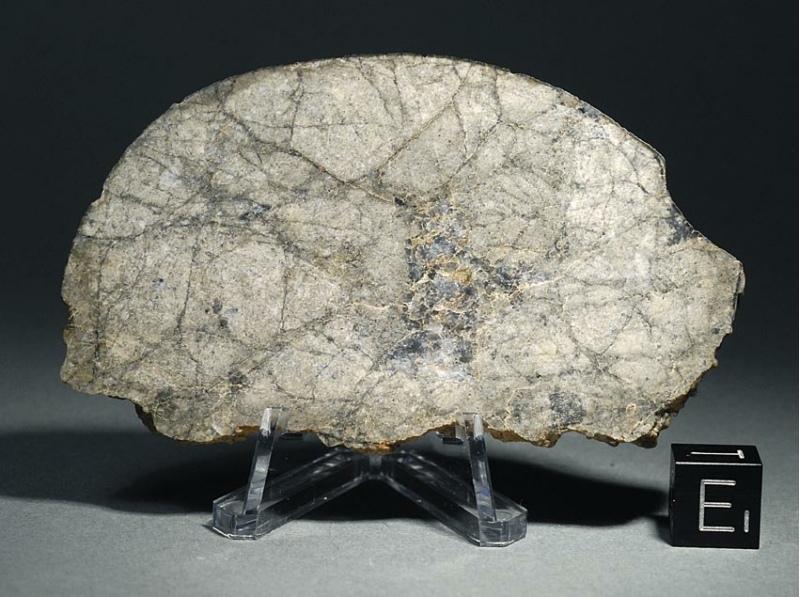 History: The meteorite was found by an anonymous finder in Northwest Africa and bought by the main mass holder in Quarzazate, Morocco. 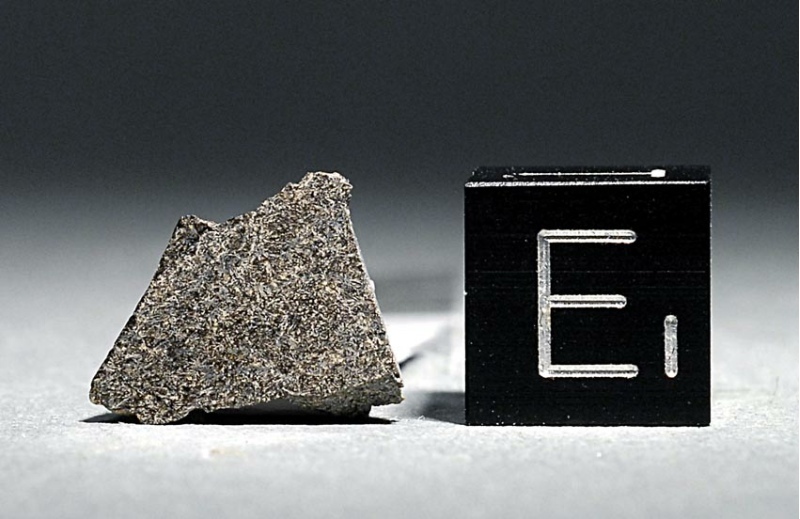 Physical characteristics: One fragment almost completely covered with fusion crust weighing 137 g was found. Petrography: (A. Greshake, MNB). 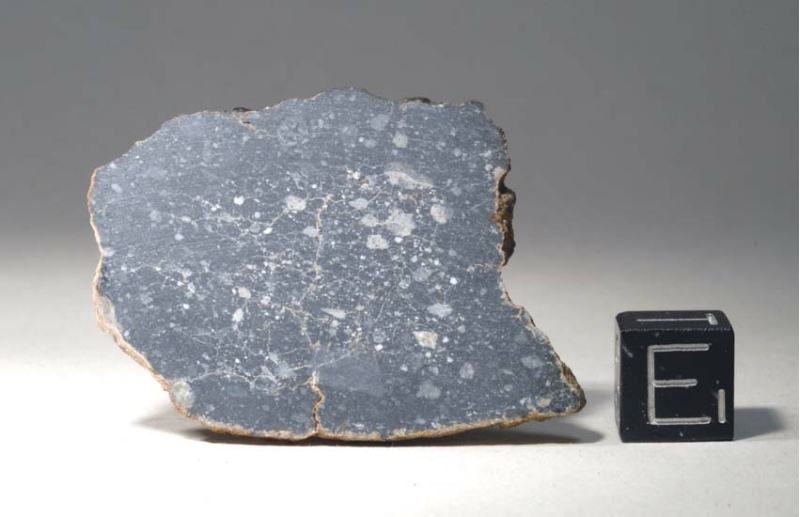 The meteorite exhibits a spherulitic texture of dominantly lath-shaped plagioclase, pyroxene, and skeletal ilmenite. 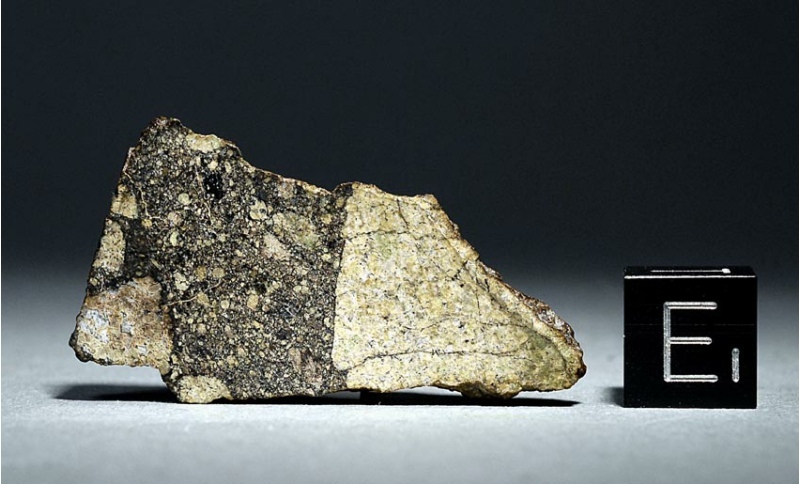 Olivine occurs as single larger crystals often containing Ti-rich chromite inclusions. Plagioclase is Ca-rich and has been completely transformed into maskelynite during shock metamorphism; pyroxene is compositionally zoned Ti-rich pigeonite and augite. Minor phases include FeNi-metal and troilite. Geochemistry: Plagioclase (An92.6-96.5), olivine (Fa26.3-27.2; FeO/MnO = 73-92), pyroxene (Fs25.1-58.7Wo13.2-34; FeO/MnO = 42-76). Classification: Achondrite (Lunar basalt); exstensive shock, minimal weathering. Specimens: A total of 21.1 g plus one polished thin section are on deposit at MNB. Ralew holds the main mass. Fresh monomict breccia consisting of ferroan gabbro clasts and related debris. Composed mainly of olivine (Fa29.6-39.9, FeO/MnO = 82-116), various clinopyroxenes and anorthite, with accessory fayalite, silica polymorph, ilmenite and minor K-Ba-feldspar. Clinopyroxenes (both as individual grains and regions within zoned grains) comprise pigeonite (Fs42.3Wo11.9, FeO/MnO = 79), subcalcic augite (Fs28.7Wo26.2, FeO/MnO = 57) and subcalcic ferroaugite (Fs64.4-78.8Wo26.3-26.2, FeO/MnO = 78-93). Notable in this specimen are grains composed of symplectitic intergrowths of hedenbergite+fayalite+silica, which presumably represent subsolidus breakdown of original pyroxferroite. Orthopyroxene is absent and no basaltic-textured clasts are present.